Guest Blogger Week: Day 6: Elma’s Drugstore Foundation Battle! Today you will go through three intense rounds in the battle between The Loreal True Match Foundation and The Revlon Colorstay Foundation. Today is the day where you will get to know who the true hero is. Judging criteria comprises of three fair rounds :- Packaging, Quality and last but not least, Price and Availability. So there goes the bell ! Let the battle begin ! First up, reigning from the Loreal Group of Manufacturers, weighing in at 30 ml , is the well loved Loreal True Match Foundation. With unbreakable glass packaging along with a secure glass top and a metal pump, this looks chic on the dressing table. If you are someone who is as clumsy as Clumsy the Smurf, then even if it falls 99 times, it won’t break and cause work for you. And for people like Columbus, who love discovering places, then this also satisfies your demand of being very travel friendly and gives you the assurance of not thinking about a foundation spillage in your favourite travel makeup bag. Up next, reigning from the Revlon Group of Manufacturers, weighing in at 30 ml, is the most appreciated Revlon Colorstay Foundation. Being made out of glass with a black metal pump, the plastic black cap just makes it look sort of cheap and not very showcase friendly. This also bids goodbye to all Clumsy the Smurfs in this world because if it falls it won’t break, BUT the metal pump will! So you will end up just staring at a useless bottle of foundation. For all the travellers, this is sadly not for you, because the cap is not a good fit for the bottle, and therefore, can easily come off. Scent is a quality which can help us overlook certain bad things about the products. Sadly, both of these foundations smell like paint. Why do they not smell like a vanilla cupcake or even chocolate? It would make us use it more often and help us get the AAFS ( Addicted To Applying Foundation Syndrome – not fatal ). Loreal True Match – It has a very creamy texture that is not watery. It is very blendable and buildable. It improves your complexion and gives a low- medium coverage. It also has ultra fine pigments to make your skin look smoother and in short, can be seen as ‘your skin but better’ option. Plus, no worries when your out in the sun, as it also has SPF 17. Searching for a no-makeup makeup look foundation? Look no further! Revlon Colorstay – It has the same creamy texture as the Loreal one and is also very blendable and buildable. It gives a medium to high coverage with a flawless finish. It also reduces your chance of getting sun related skin problems by 1%, as it has SPF 15 in it. So who wins this tough round, well it is The Revlon Colorstay. Wondering why? Well, the Loreal True Match has a tinge of shimmer in it which might just make you look sort of like a disco ball and I dont like the fact that people keep asking ‘did you just play with glitter?’ when I wear this. Ugh! Embarrassing! Ooh the battle just got even. So this round is the tie breaker.Lets begin this intense, nail biting, nerve wrecking…. Oh forget it ! Round 3! The Loreal True Match Foundation retails for $9 (UK £9.99) and the Revlon Colorstay Foundation also retails for $9 (UK £12.49). Okay, so the competition is still pretty even. Wow! I can’t stop the competition just yet, so lets look at their availability and not to forget how your face will probably look at the end of the day. Loreal True Match Foundation – It is available in 20 shades. It is also formulated to suit every skin type. At the end of day, this foundation does tend to oxidise and will make you look a teeny bit darker. It also does not control oil to a big extent, so you will need to use a powder during the day to keep your face shine-free. It also does not get cakey at all. 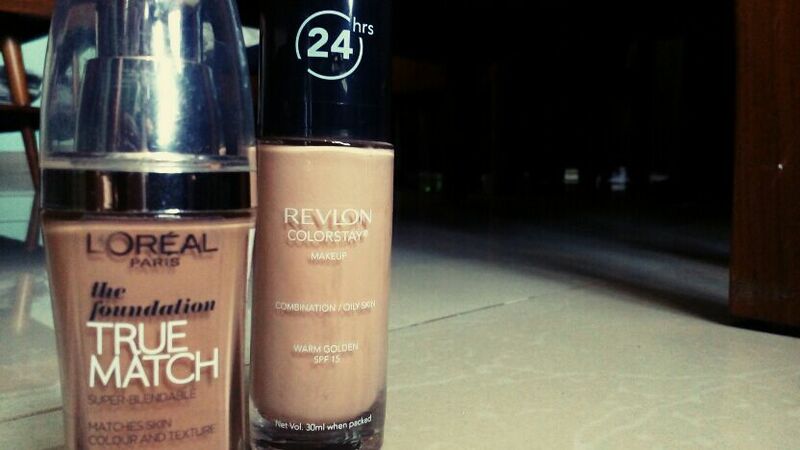 Revlon Colorstay Foundation – It is available in 20 shades too. The interesting fact is that they have foundations for specific skin types. That is, if you have oily skin then you have a foundation formulated particularly for it and also since it has a huge shade range you will also get a really close shade to your complexion. At the end of the day, your face does not look very shiny nor cakey but it does loose a tinge of the flawless finish it gave you when you first applied it and so you will have to use a good powder on top throughout the day. And so round 3, comes to an end. Do we have an obvious winner ? Oh yes we do. It is the Revlon Colorstay Foundation. Even though this does not abide to our good packaging criteria, the quality and the finish it gives are amazing and the fact that you get a foundation to suit your skin type is also pretty great. The Loreal foundation is not bad at all. I have heard so many people rave bout it but I feel the Revlon Colorstay Foundation is a half point better and for to me it is the winner! P.S Don’t forget to check out Elma’s Blog and follow her on Twitter! This was so fun! Good job guest Elma! I love Loreal True match so I may love the colorstay (which I haven’t tried) even more! You guys get pumps. US does not! What gives? Great post and you compared two perfect products! 👍 I don’t have True Match (just the Lumi) but I do have Colorstay and I agree with your findings on it!